Discussion in 'Femmes' started by lanvinray, Jan 29, 2019. AT ELITE MODEL LOOK WE SAY: “YOUR DIFFERENCES MAKE OUR WORLD”. WHAT MAKES YOU DIFFERENT? I believe it is my perseverance that makes me different. When I do something, I will put all my effort into it. I love playing piano. I started to learn it when I was a little girl. At the beginning, it was difficult, but as I got older I developed a love for it and its such a big part of my life. When I feel sad, playing the piano helps me to relax. I’ve been playing for over 8 years, it gives me so much comfort. DO YOU HAVE A HERO WHO INSPIRES YOU TO SUCCEED? A close friend of mine has really supported me throughout this experience and given me lots of confidence. I could not have got this far without her, she's the kind of friend that will always help you find your way, if you’re feeling lost or conflicted, she is definitely a hero of mine! MOVIE: The Legend of Piano (1999). Because I love playing the piano, and this movie gives me a lot of inspiration and profound thoughts. ICE CREAM FLAVOUR: strawberry because it is both sweet and sour, which is a bit like me. I’m a bit of a chameleon and can change it up in front of the camera! INSTAGRAM ACCOUNT: Diet Prada. I love reading their fashion commentary and I learn a lot from it. INSPIRATIONAL QUOTE: "The wind's direction is determined by the tree, the person's direction is determined by yourself." SPORT: I like running and yoga, they help make me more athletic and keep me fit. MODEL: Naomi Campbell. Her catwalk is very unique. I hope I could also develop my own style and have a long-lasting career like hers. That must be my trip to Japan. I went to Hokkaido. The snow-covered landscape was impressively beautiful. I’d love to go back one day. IF YOU COULD GO ANYWHERE IN THE WORLD – WHERE YOU HAVEN’T ALREADY BEEN – WHERE WOULD YOU GO? I would go to the North Pole, because I really want to see the polar light. HOW DOES IT FEEL TO REPRESENT CHINA AT THE 35TH ELITE MODEL LOOK WORLD FINAL? It is a real honour for me to be the Winner, and I am grateful to everyone who supported and helped me. I’ve always been a huge fan of the competition, I really think it really gives you a taste of what its like to be a model and I have always wanted to be part of Elite Model Look. 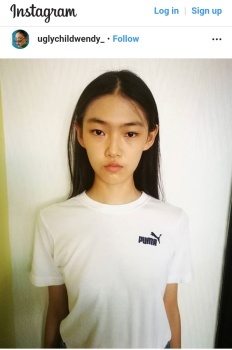 I went to the casting and was so happy when I was selected. My parents have been really supportive and have always encouraged me to be who I am and to always try my hardest. I really enjoy modelling, it makes me feel more confident. I'm really looking forward to the World Final, I hope I’ll do even better than last time and I'm looking forward to meeting the other contestants at the Final, I feel like it’s an excellent way to broaden my whole life and to improve myself from learning from others. I’ve met some of the Finalists of Elite Model Look China from previous years. They’ve all be so kind and willing to help me and the other new models. They’ve given us useful tips to help us overcome tension and to how to improve even more. I feel honoured to join them. Congrats! Can't wait to see what she does.